I was born in 1967 and that year was a great year for muscle cars. One of my favorites from that year was the Chevrolet Chevelle SS396. The 1967 Chevy Chevelle featured clean simple styling and when coupled with the optional L78 375hp big block 396 engine and a 4-speed, it was a powerful competitor in the muscle car wars. 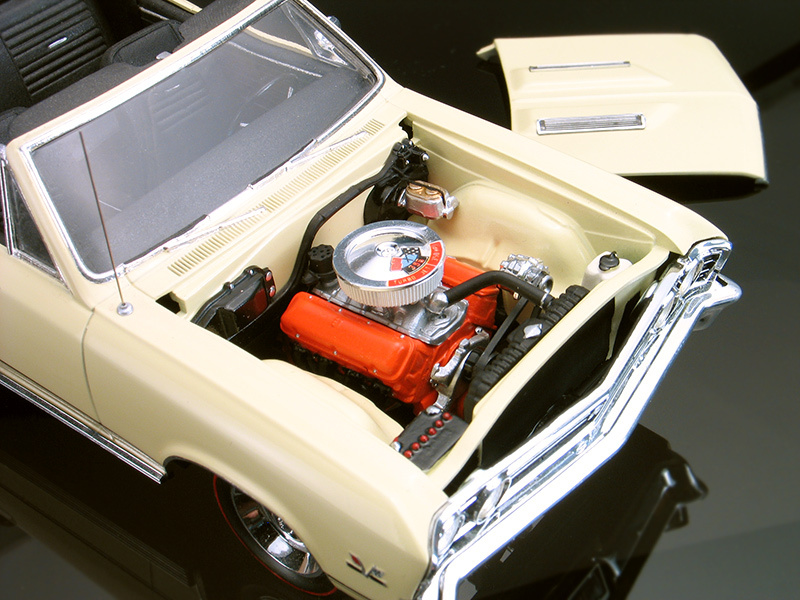 Revell makes a very nice 1/25th scale kit of the '67 Chevelle SS. The kit was introduced back in 1992, and I immediately built one. I wanted to make my SS a little different though, so I decided to convert it into the convertible version. To convert my Chevelle into a convertible I began with removing the roof. 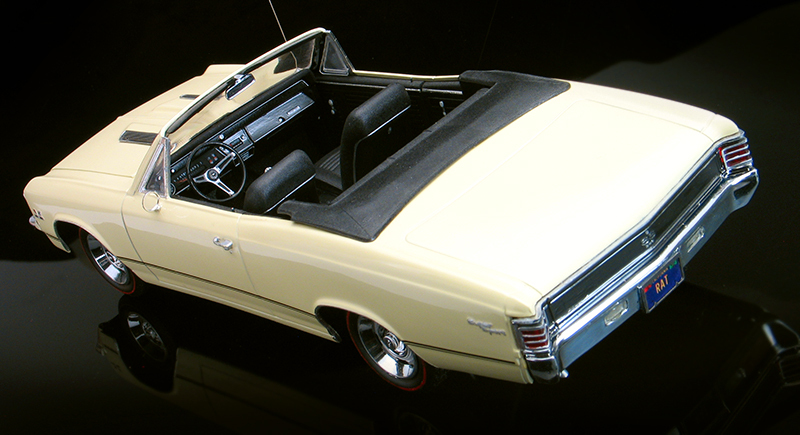 I used a convertible boot from an AMT '65 convertible Pontiac GTO kit and scratch built dog legs for it around the back seats. Something to keep in mind, I built this model back before the internet. Research material was a lot harder to come by in those days. Back then, I assumed the convertible boot for mid sixties intermediate GM cars would have been the same. But, later I found out I was wrong. The '65 GTO boot has a different shape and is not correct for a '67 Chevelle. It should curve out from the interior instead of curving toward it. That's OK though, the boot still looks nice and most people probably wouldn't notice if I didn't point it out to them. 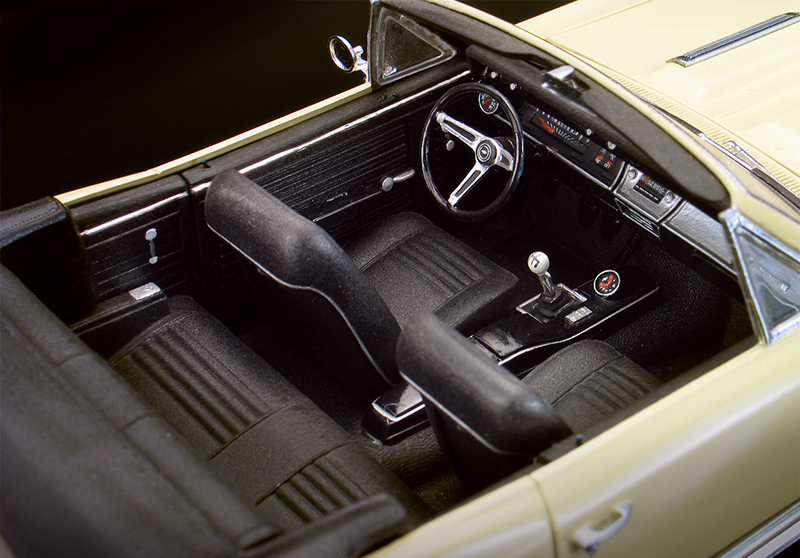 In addition to the convertible mod, I also added a couple of other things to add some extra detail to the model. The door handles were drilled out for a little more realism. I added door locks to the interior. I also added photo-etched license plate frames and an antenna. The redline tires were hand painted using a ruling pen and a compass. My grand father owned a real '67 Camaro painted in Buttercup Yellow. Chevelles were also available in that color and I've also liked that it, so I obtained a spray can of matching factory Chevrolet Buttercup Yellow touch up paint and painted with that. Afterward, the paint was wet sanded with 8000 grit paper and hand polished to a mirror finish with Micro Glaze compound. 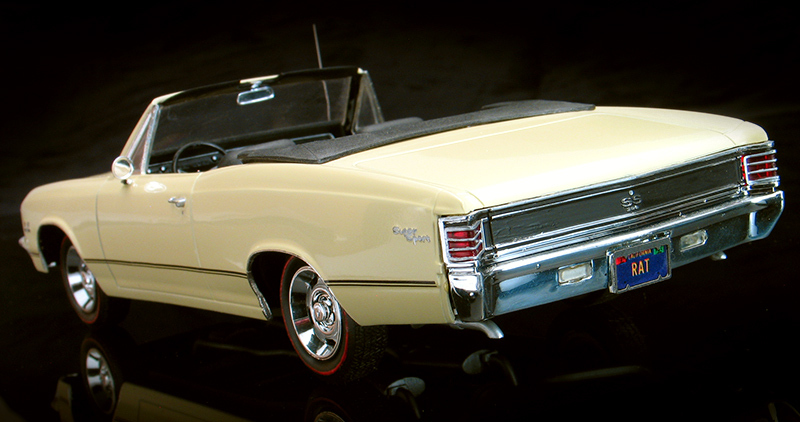 I recently pulled my Chevelle out of show case to do some repair work on it and re-photograph it for this web site. It's held up pretty well over the years, but along the way the driver's side lower trim has gone missing. Since I've had this Chevelle in my collection, it has traveled across many states and was exhibited in many contests. It was even pictured in Plastic Fanatic magazine back in '92.